I've actually gotten something like this as a gift and I really enjoyed it. It is something you can save for one of those days when you feel you just need to have something chocolaty. 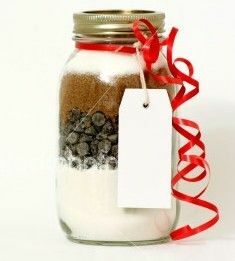 Once you’ve filled your jar, decorate with custom labels and tags. You could probably do something similar with cookies and I know people do hot chocolate all the time but you could had some mocha into it to make it evey better.